IndigoVision is a leading manufacturer of complete end-to-end IP video and alarm management security solutions for CCTV surveillance applications. IndigoVision is widely chosen for projects in airports, city centers, ports, mines, road and rail systems, education, banking, casinos, prisons, government and the military. These enterprise-class systems improve organizations’ operational efficiency, enhance public safety and enable timely emergency response. 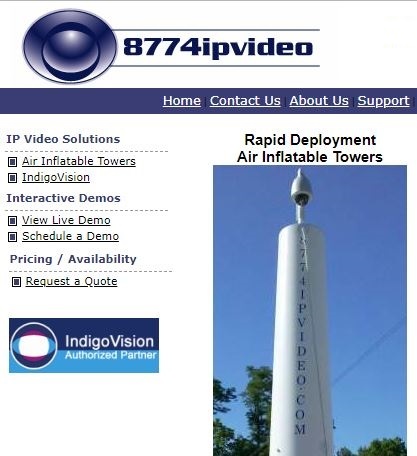 8774ipvideo Rapid Deployment Air Inflatable Towers are custom designed for your video surveilance cameras, antennas, and lighting applications. Most units can attach to the trailer hitch of a vehicle and inflate in minutes. Add a 4G or broadband wireless connection to stream live video back to your dispatch control center. While these towers support any camera, we recommend our IndigoVision 1080p cameras using only 2Mbps to stream high quality video over most wireless networks.